I am a Certified Equine Sports Massage Therapist (ESMT) and Certified Canine Massage Therapist (CCMT). While I am confident at work, I struggle with confidence in the saddle. I left riding as a teenager due to anxiety but returned as an adult after having my first child. This time around is a lot different. I’m older, I’m less flexible, and I’m a lot farther from the ground. Not to mention, I have three daughters at home depending on me. I still doubt myself but my determination to pursue my passion with horses is a constant struggle that I’m working on every day with my pony Ferrous. My advice to you? Never give up. Be bold and step outside your comfort zone. 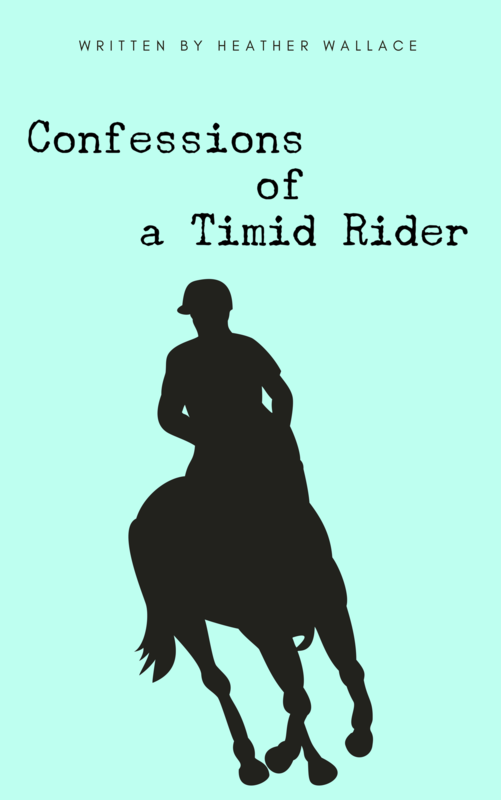 I am perhaps best known for my best-selling book, Confessions of a Timid Rider, which won the 2018 Equus Film Festival WINNIE award for Best Non-Fiction. I have also written for a number of publications including Holistic Horse Magazine, Sidelines Magazine, and Equine Info Exchange among others. View my portfolio for more information. I am a proud part of The Gobi Desert Cup, which I joined in 2018 as the Media Coordinator. This endurance horse race and cultural experience in Mongolia is unlike anything else I’ve ever done. Not only does this experience take international riders to the heart of this vast country, away from technology and back to basics, but you learn so much about yourself and your horsemanship also. To learn more, or to apply, visit www.gobidesertcup.com. Are you a brand, marketing rep, or press member? Please view my Media page for more information. Confessions of a Timid Rider is the best-selling memoir detailing Heather Wallace’s insights about being an anxiety-ridden but passionate equestrian. After returning to riding as a mother, she is determined to follow her dreams in spite of the fear that she is somehow lacking in talent or ability. An in-depth look into the heart and head of a returning adult equestrian, this memoir is not limited to those people with horse experience. In fact, Confessions of a Timid Rider is the perfect book to read for anyone who questions their value and worth in their designated profession or life choice. Motivational and inspirational, this book will make you determined to pursue your dreams despite the inner voice that says you aren’t good enough. Winner of the 2018 Equus Film Festival WINNIE award for Best Non-Fiction English, and #1 Hot New Release on Amazon. A bestseller in three Amazon categories. Photography edition: As equestrians we are united by our love of horses. But whether you own, lease, or borrow some days you just want to call your trainer and cancel. For those days I’ve compiled a handy list of excuses to tell our trainers, our horses, or ourselves for why today just isn’t a good day to ride. Suitable for every level of rider, from lead line to Grand Prix. Potential excuses cover ~ weather ~ your mood ~ your horse’s mood ~ random acts of laziness. As equestrians we are united by our love of horses. But whether you own, lease, or borrow some days you just want to call your trainer and cancel. For those days I’ve compiled a handy list of excuses to tell our trainers, our horses, or ourselves for why today just isn’t a good day to ride. Suitable for every level of rider, from lead line to Grand Prix. The first release of this sassy little book, it is perfect to give as a gift or stocking stuffer to the horse lover in your life. Become a member of my private Facebook group. Join the herd of riders determined to find confidence in and out of the saddle.